This book is essentially different than the many books which have been written by the so-called “experts” on the subject of child rearing. Most experts tend to devise and then expound on their own theories and present parents with specific untested rules to follow. A “theory” according to what the dictionary defines, is: “A plan or theme existing in the mind only, a speculative or conjectural view of something”; also, “Abstract knowledge of any art as opposed to the practice of it”. Another listed explanation is, “A closely reasoned set of propositions, derived from and supported by established evidence and intended to serve as an explanation for a group of phenomena: the quantum theory”. Children, although some could be defined as “abstract characters”, are certainly not the same and cannot be grouped into one category. Even in the same family, there are many differences in personality. Some of these differences are readily seen, while some are much more subtle, and can only be identified by the parents. Responsible Teens is not based on a theory, which existed only in the mind, but instead, it is based on years of actual, hands-on experience. The experience that only an actual parent can obtain. This experience was derived over nearly 50 years, from actual practice with real children. Experience from birth through the marriage of the children, and then with grandchildren. Along with the hands-on experience has been very close interaction with hundreds of other parents and their children. This book does not consist of set rules to follow, but rather involves the very “basics” of human interaction. Most of this, I’m sure you are already aware of. Some of this information might help you to look at things a little differently. One thing is sure: children are little human beings and we need to be aware of how even seemingly insignificant words or actions can affect them, both now and in the future. Although I do believe in a Supreme Being, or God, I have not included any religious instruction in this book. That is for people to decide for themselves. I’m sure that you will find however, that everything discussed herein, bears no conflict with any religion. It is merely a collection of common sense, basic human concepts, which are too often overlooked in these days of seemingly increased turmoil within the family unit and especially, in the teen population. 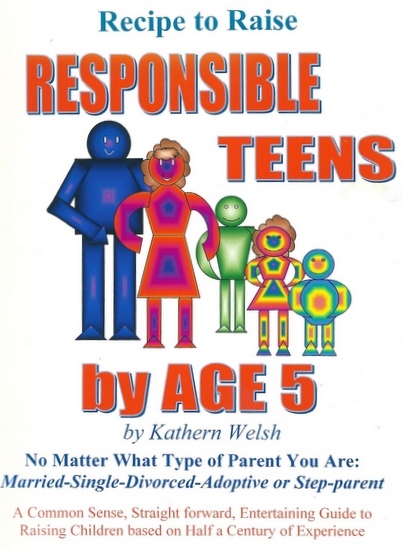 Regardless of the situation you find yourself in, whether you are married, divorced, single, a step-parent or adoptive parent, and regardless of whether you are rich or poor, it is still possible to be a responsible parent and help your children to grow into responsible teens. These teens then, will have the chance to become the responsible adults they should be. Everyone admires responsible teens, those who have them and those who don't. Everyone wants their own children to grow into responsible teenagers, but it doesn't just happen! It's important to realize that helping responsible teens to emerge from toddlers takes time, patience and understanding, among other things. Responsible teenagers don't magically emerge from carefree adolescents. Believe it or not they grow from responsible children, and responsible children grow from well supervised, disciplined with love, toddlers. The innumerable people who bought into the various fads of progressive child rearing, as well as the misguided age of permissiveness, called "creative child rearing", were sadly misled. These ill-informed parents have sown the seeds for many troubled teenage years both for their children and for society. This is quite evident in the rising number of violent acts committed by teens and adolescents. Successful child rearing is not dependent on what the parents do for a living, or what career the child may eventually choose, or how much money the family has, or which rung on the ladder of success the parents have reached. It is based on the emotional well being of the child during his formative years and as an emerging adult. The building of a person's self-confidence and individual ability to deal with life's problems is the most important aspect of nurturing the young, yet the most neglected. It has become more and more evident that having responsible teenagers is the result of proper "early" training and the experiences encountered during the very early, formative years. These critical formative years, as many are beginning to realize, is the first five to seven years of a child’s life.